Otávio Antunes временно не работает. I have been working as a private languages teacher for 4 years. 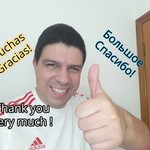 I teach english, spanish, russian and portuguese. I worked in a hotel as a receptionist and in industries as an international buyer. I have enough professional experience to help you about your professional needs. I am brazilian and I like sharing my knowledge with the students. I am ready to help you according to your need. Here in Brazil I have a register as a teacher. I pay the taxes here to work as a formal private languages teacher.